This is guest post from IMTFI researcher Erin Taylor, on the new Citi Money Gallery exhibit at the British Museum. Nestled between Andy Warhol's 'Nine Dollar Signs' and a Barbie cash register, Haiti's mobile money is making an appearance in the British Museum. Over the next few months, a collection of money-related objects such as phone cards, mobile handsets, Haitian currency and even underwear with a secret pocket will be on display in the Citi Money Gallery to show Haiti's recent transition to mass-accessible electronic payments alongside everyday accoutrements of popular financial practices. The Citi Money Gallery was officially opened on June 12 by Naveed Sultan, the CEO of Global Transaction Services at Citigroup, and Sir Mervyn King, the Governor of the Bank of England. Their participation was testimony to the significance of the newly-renovated exhibition under the curation of Dr. Catherine Eagleton. Featuring more than a thousand objects from the Museum’s extensive collections, the Citi Money Gallery looks at the history of the world through the lens of money, from 4500 years ago to the latest developments in digital technology. 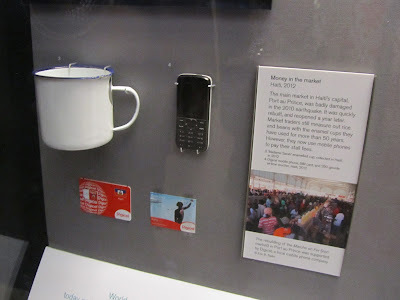 Haiti's mobile money fits into the exhibition as an example of the ways in which money practices are changing globally. What I found most interesting about this juxtaposition was how, when placed next to these far older money forms, mobile money didn't seem any more abstract or virtual than its far older counterparts. Whether we are talking about hand-engraving coins, signing bits of paper, marking tally sticks, fashioning shells or recording numbers on a computer, all money requires some kind of material form to register accounting. In the context of Haiti, this materiality matters in a number of ways. This became evident when we were collecting objects for the British Museum's display. It made us stop to think twice about what the materiality of mobile money might entail. In many ways, mobile money seems more like something people do than an actual product. The most obvious object to collect was the mobile handset itself. Clearly, to be able to use mobile money, Haitians must own mobile phones and the telecommunications structure with which to use them. Until just a few years ago, mobile telecommunications were a luxury for the majority of the population: even if one could afford a phone, there was often no signal tower within useful reach. Today, according to the GSMA Mobile Money Tracker, mobile penetration in Haiti is estimated at 10.79% percent, and far more people have access to a phone through family and friends. Mobile money has more surprising ramifications beyond handsets and towers. Given that just 15% of Haitians have bank accounts (GSMA), security and storage are major issues in handling money in Haiti. Whether storing money at home, carrying one's own money around the city, or sending money between towns via bus or boat, Haitians develop measures to keep their cash safe. The pocket underwear in the display are often worn by women known as Madame Saras who run Haiti's informal market system. They wear them as they carry produce from the country to town markets, or when they travel to Port-au-Prince to buy non-perishable goods to sell back home. Also in the display is a money box with a secret compartment, one of many that is designed to hide money at home or deter spending. One of the more obscure, but interesting, items in the display is a metal cup that Madame Saras use for measuring out quantities of rice and beans for sale. We felt that these cups deserved a place in the display because they are such a stalwart of history throughout this small Caribbean nation. The anthropologist Sidney Mintz (1961) observed the use of these cups in Haiti's south back in the 1960s, and published a fascinating article explaining how vendors and customers haggle, altering both the quantity of goods for sale and the price simultaneously to come to a suitable deal. When trying to understand money culture, these things matter. Funded by the Institute for Money, Technology and Financial Inclusion (IMTFI), our mobile money research is part of a broader project, Mobiles, Migrants and Money: Mobility in Haiti and the Dominican Republic. Along with Dr. Heather Horst and Dr. Espelencia Baptiste, we discovered that the new mobile money system, launched in November 2010, is changing the ways in which people handle cash. Haitians are not just adopting Digicel's TchoTcho Mobile and Voila's T-Cash to send money to relatives in other towns (traditional domestic remittances), but they are also using their accounts to store money for later use – what we call 'Me2Me' payments. The greater security of the storage medium makes money less visible and therefore more secure than cash. Money also requires our trust in the system: we would not accept these abstract tokens without having faith that we can readily exchange them for consumer items, or store them for a later date. The Citi Money Gallery exhibition provides much food for thought on the prevalence and means of fraud throughout the past few millennia. Issues of trust surrounding Haiti's mobile money have less to do with counterfeiting cash, falling more squarely on the question of whether people will trust the new system enough to use it. Will the money arrive? What am I being charged? And who is storing my money? The advantage of mobile money to overcome trust issues stems from the mobile handset itself. With plenty of experience topping up phone credit, customers already know that the system works. Furthermore, according to a report by InterMedia and backed up by our own research, Haitians tend to have a high level of trust in the telecommunications companies that run mobile money services. In fact, they trust them far more than they trust the national government, NGOs or even the Central Bank. Throughout history, the ability of fiat money to function as a unit of exchange is reinforced when that money is issued, or monitored, by trusted agencies such as kings, governments, or companies. There is, then, a great deal of continuity between old and new forms of money. The only major difference is the time it takes for the accounting to be done. Rather than waiting for a payment to arrive from ancient Persia, or sending cash from the Haitian-Dominican border via nine-hour boat ride, transfers of value can be made instantly. And if the movers and shakers in electronic finance have their way, in a few short years the materiality of money may be limited to the ledgers that are used to record accounts: that is, the computers and telecommunications infrastructure that comprise the basic platform of money today. Mintz, S. W. (1961). Standards of Value and Units of Measure in the Fond-des-Nègres Market Place, Haiti. Journal of the Royal Anthropological Institute, 91(1), 23-38. Very interesting article. Haiti has similar problems to some African countries, like Kenya. Most of the population do not have access to banking accounts, and transactions are too small to have banks stepping in. I did an analysis in a very good example, Kenya’s M-PESA ( http://intelligentinclusion.com/2012/08/how-can-we-use-mobile-money-to-serve-the-unbanked/ ) , that took off faster than expected. It is encouraging to see that these initiatives are being spread around the world. Posts by guest bloggers are those of the author and do not necessarily reflect the views of IMTFI. Is the Rural Hometown a Worthwhile Investment? IMTFI (2011) Institute For Money, Technology & Financial Inclusion. Simple theme. Powered by Blogger.